Variations in atmosphere oxygen and ocean sulfate concentrations through time are regarded as important controls on the cycles of sediment-hosted and volcanic-hosted ore deposits. However, estimates of atmosphere oxygen in the Proterozoic have been frustrated by the lack of a direct measurement method and conflicting evidence from various proposed geochemical proxies. Studies in the 1970s to 1990s suggested a relatively oxygenated atmosphere (> 3 wt% O2) in the Proterozoic. However, since the late 1990s, new proxies and modelling have suggested very much lower levels of oxygen (< 0.02 wt% O2). Focusing on redox-sensitive trace elements, here we combine a dataset of over 3000 LA-ICP-MS trace-element analyses on sedimentary pyrite, standardised against Berner’s Phanerozoic O2 modelling and direct measurement of oxygen concentrations in fluid inclusions in sedimentary halite, to develop the first detailed estimate for atmosphere O2 concentration and secular variation from 2200 Ma to the present. The estimates suggest dynamic cycles of atmosphere oxygen that increased in frequency through time. There were possibly three first-order cycles in the Proterozoic varying from 400 to 600 million years in length and a further five first-order cycles in the Phanerozoic from 60 to 120 million years in length. Our estimates of oxygen concentration are at odds with most previous estimates. We suggest, rather than very low atmosphere oxygen in the Proterozoic, the mean concentration was about 7 wt%, rising to a mean of about 10 wt% in the Phanerozoic, but with significant cyclic variation of up to a maximum concentration of possibly over 30 wt%. We observe that the proposed oxygen cycles correlate with biodiversity cycles and to the timing of major stratiform base-metal deposits in sedimentary basins. For example, minima in atmosphere oxygenation correlate with mass extinction events and stratiform Zn–Pb–Ag deposits, whereas maxima in oxygenation correlate with major evolutionary events, global periods of evaporite formation and the timing of stratiform copper deposits. The online version of this article ( https://doi.org/10.1007/s00126-019-00873-9) contains supplementary material, which is available to authorized users. The levels of oxygen in the Precambrian and Phanerozoic atmosphere are poorly understood and remain one of the unresolved topics in earth sciences. This issue is critically important as it is generally accepted that levels of oxygen in the atmosphere and ocean are key factors in driving biological evolution (Cloud 1976; Holland 1984; Canfield, 2005; Berner et al. 2007; Lyons et al. 2014) and formation of sediment-hosted ore deposits (Holland 1984; Large et al. 2017). The pioneering research between 1980 to 2010 of Cloud, Holland, Kump and co-workers recognised two important times of oxygen increase, referred to as the Great Oxidation Event (GOE) and the Neoproterozoic Oxygenation Event (NOE). They determined the first rise, GOE, around 2500 to 1850 Ma, which increased pO2 from extremely low levels (~ 10−2 PAL or 0.02 wt% O2) to greater than 15% PAL or 3.2 wt% O2 (Knoll and Holland 1995; Holland 2006; Fig. 1a). The second step, NOE, occurred at the end of the Proterozoic, when pO2 levels may have risen to the current level of 21 wt% O2. Evidence for these changes was provided by geochemistry and paleontology. In the case of geochemistry, the primary tools were banded iron formations, red beds and evaporite distribution (Roscoe 1969; Cloud 1976; Stewart, 1979; Holland 1984; Eriksson and Cheney 1992), paleosol geochemistry (Holland 1984; Pinto and Holland 1988; Holland and Feakes 1989; Holland and Beukes 1990) and carbon and sulfur isotopes of marine carbonates and sedimentary pyrite (Claypool et al. 1980; Veizer et al. 1983; Knoll and Walker 1990; Derry et al., 1989). These major step changes in atmospheric oxygen levels have been linked with evolution and diversification of early life, particularly eukaryotes. For instance, eukaryogenesis has been attributed to the GOE (Gross and Bhattacharya 2010). However, alternatively, eukaryogenesis (burial and export of organic carbon) may have triggered the GOE (Butterfield 1997). Paleontological evidence, globally, so far suggests that the microfossils that can be positively assigned a eukaryotic affinity evolved and became widespread between 1800 and 1400 Ma (Butterfield 2015; Javaux et al. 2004). The NOE event is also closely linked with the Cambrian explosion of life forms including animals (Canfield et al. 2007; Och and Shields-Zhou 2012; Sahoo et al. 2012). Although these two oxygen steps have now become well accepted (Holland 2002, 2006; Canfield 2005; Kump 2008; Lyons et al. 2014; Fig. 1), the actual timing and magnitude of each step is poorly constrained and the variation between the steps has been assumed flat, but without compelling evidence. For example, Kump et al. (2011), concluded, based on the study of 3500 m of drill core in the FAR-DEEP (Fennoscandia Arctic Russia-Drilling Early Earth Project), that the GOE, rather than a discrete event, played out from ~ 2500 to 2000 Ma, O2 rising initially at 2500 Ma, again at ~ 2400 Ma with the loss of S-mass independent fractionation (MIF), and then increasing gradually to 2000 Ma with extensive organic matter burial. Research over the past 20 years has employed a large number of geochemical proxies, particularly from marine pyritic black shale, to attempt to resolve this impasse, in particular, redox-sensitive trace elements (Canfield et al. 2000; Farquhar et al. 2000; Anbar et al. 2007; Scott et al. 2008; Sahoo et al. 2012; Partin et al. 2013; Reinhard et al. 2013) and the isotopes of S, Mo, Se, U and Cr (Arnold et al. 2004; Wille et al. 2007; Frei et al. 2009; Sahoo et al. 2012; Partin et al. 2013; Reinhard et al. 2013; Planavsky et al. 2014; Cole et al. 2016). The current paradigm, summarised in Lyons et al. (2014; Fig. 1c), expands on the two-step model developed previously (Knoll and Holland 1995), but with a significant difference: following the GOE, at around 2200 Ma, pO2 rises to about 20 wt% O2 and then rapidly drops back by ~ 2100 Ma to 0.2 to 0.002 wt% O2, remaining at these levels until 800 Ma where at NOE, O2 rises to current levels. This contrasts dramatically with Holland (2006), who argued that O2 in the Proterozoic varied from 3 to 8 wt% (Fig. 1c compared with Fig. 1a). Recently, two other approaches have been attempted: the trace-element chemistry of marine pyrite as a proxy for ocean trace-element chemistry (Large et al. 2014, 2015b, 2017; Gregory et al. 2015a; Mukherjee and Large 2016) and direct measurement of O2 in fluid inclusions in marine halite (Blamey et al. 2016). Here, we use results from these two novel methods plus modelling of Phanerozoic O2 by Berner (2009), to develop an alternative view of O2 levels in the Proterozoic and Phanerozoic. We suggest that O2 was much higher and more variable than current estimates. Our modelling suggests that O2 may have reached ~ 18 wt% following the GOE (2000–1800 Ma) and then gradually declined to ~ 5 wt% until 1500 Ma. Oxygen then peaked at ~ 11 wt% at 1350 Ma, followed by a steady decline to < 2 wt% at ~ 1000 Ma. Finally, at 560–540 Ma, O2 rose steeply to ~ 25 wt% marking NOE and the Cambrian explosion (Fig. 1c). Five cycles of oxygen change are suggested through the Phanerozoic. Berner et al. (2013), Large et al. (2014, 2015b), Gregory et al. (2015a, b), Gallagher et al. (2015) and Mukherjee and Large (2016) have investigated the potential of using laser ablation inductively coupled mass spectrometry (LA-ICP-MS) analysis of trace elements in marine pyrite in black shale and limestone to estimate first-order trace-element trends in past oceans. The technique is based on the premise that marine pyrite that develops in anoxic to euxinic environments, in the water column or the top few centimetres of the organic-bearing muds, adsorbs certain trace elements in proportion to their concentration in seawater (Fig. 2; Huerta-Diaz and Morse, 1992; Large et al. 2014, 2017; Gregory et al. 2015a). The proof of concept was outlined in Large et al. (2014) and further discussed in Large et al. (2015b, 2017). In Fig. 2, we have plotted the mean trace-element concentration of sedimentary pyrite from the Cariaco Basin (Lyons et al. 2003) against the mean concentration in present-day seawater (Turekian 2010). This shows two positive trends: the upper trend line corresponds to nutrient and conservative trace elements with a long residence time in the ocean (> 5000 years; Mo, As, Ni, Zn, Se, Sb, Cd, Tl, Ag), whereas the lower trend line corresponds to scavenged trace elements with a short residence time (< 500 years; Mn, Pb, Co, Te, Bi). For both groups, the order of concentration in sedimentary pyrite is very similar to the order of concentration in average global seawater. This confirms two previous proposals by Large et al. (2014). Firstly, the source of trace elements in sedimentary pyrite is principally from seawater, and secondly, the trace elements are incorporated into sedimentary pyrite in the same relative concentration as they exist in contemporaneous seawater. An additional conclusion from Fig. 2 is that scavenged trace elements have concentration ratios in pyrite, relative to seawater, of about two orders of magnitude greater, compared with nutrient and conservative trace elements. The technique of LA-ICP-MS measurement of trace elements in pyrite has been shown to duplicate the patterns in bulk-rock analyses but with several additional advantages (Gregory et al. 2017). Most important in the context of this research, the technique is more sensitive to low-level changes in trace-element concentrations and enables both increasing and decreasing trends in ocean chemistry to be investigated. Although Mo and U have been demonstrated as useful atmosphere–ocean oxygenation proxies for bulk black shale (Scott et al. 2008; Partin et al. 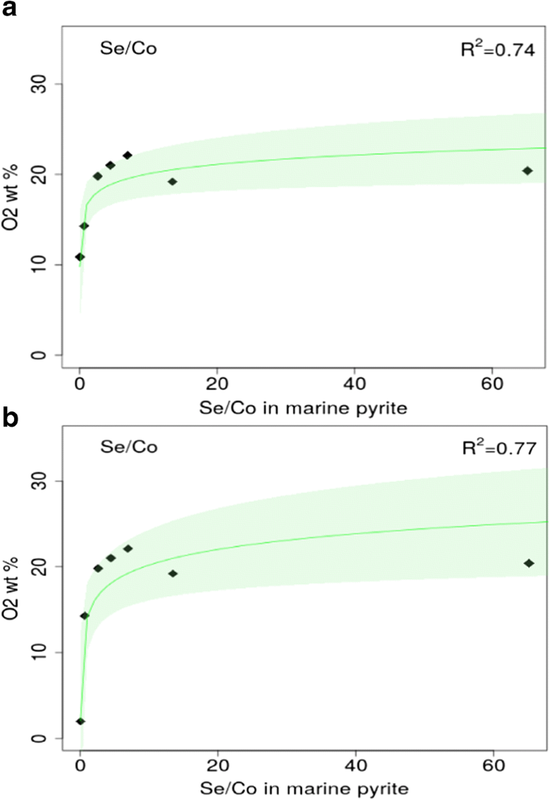 2013), Se and Co have been shown to be the most useful proxies for marine pyrite in shale (Large et al. 2014, 2017; Mukherjee et al. 2019). Trends of Se in marine pyrite, as a first-order proxy for trends in deep time atmosphere/ocean oxygenation, were first proposed by Large et al. (2014) and expanded upon with further data in Large et al. (2015a, b, 2017) and Mukherjee and Large (2016). Selenium, a naturally occurring metalloid, is unique in that although it is an essential micronutrient in most organisms, including bacteria, archaea, fish and shellfish, it may be toxic at high concentrations and has a very narrow concentration window for sustaining marine life (Hamilton 2004; Fordyce 2007). Sulfur has a very similar geochemistry to Se and has been used as an oxygenation proxy for some time (Stewart, 1979; Evans 2007; Planavsky et al. 2012); S in sedimentary pyrite indicates anoxic to euxinic conditions, whereas S in sedimentary anhydrite indicates oxic conditions. Selenium like sulfur has multiple oxidation states, but unlike S, which has only one oxic species (sulfate SO42−), Se has two (selenate SeO42− and selenite SeO32−). Under oxic geological conditions, selenate is the predominant soluble inorganic species; under suboxic conditions, selenite is predominant, but in anoxic to euxinic environments, selenide (Se2−), organo-Se complexes and elemental Se0 are most stable. Oxidation of Se4+ to Se6+ enhances Se mobility and persistence in natural waters. The main source of S and Se to the ocean is continental weathering of sulfides, mainly pyrite, where Se is released as both the selenite and selenate species (Fig. 3; Cutter 1989). At very low atmosphere oxygen, such as in the Archean, continental weathering releases little soluble Se, as the selenide, elemental Se0 and organo-selenium complexes which are relatively insoluble (Kulp and Pratt 2004). Significant increases in atmospheric oxygen, accompanied by active erosion, can lead to a major increase in the supply of both soluble Se and S to the ocean. Three Se species are present in the current ocean: selenite, selenate and a form of organic selenides (Cutter and Bruland 1984). The low concentration of dissolved oxidised Se in the upper ocean layers (Fig. 3) is due to biochemical reduction of the oxidised species into labile organic particulate matter during assimilation by marine organisms, giving rise to a typical nutrient profile. In the deep ocean, the oxidised Se species are reduced to Se0 or HSe− and incorporated into pyrite (Mitchell et al. 2012). A small fraction of the organically fixed selenium eventually deposits in seafloor muds (Herring 1991). Ryser et al. (2005) showed that Se in black shale is present as anaerobic microbial respiration products resulting from microbial reduction of Se oxyanions, including Se substituted for S in pyrite, di-selenide carbon compounds and dzharkenite (FeSe2; an isometric polymorph of ferroselite). Experimental studies (Diener et al. 2012) indicate that Se2− in solution is taken up (98%) by pyrite to produce a FeSSe compound with a slightly distorted pyrite structure. Ferroselite (FeSe2) has also been produced by reacting nano-particles of pyrite and greigite with selenite- and selenate-bearing solutions (Charlet et al. 2012). Our LA-ICP-MS imaging of pyrite in black shales of various metamorphic grades indicates that pyrite is considerably enriched in Se compared with the clay-rich and organic-rich matrices (Large et al. 2014). Our analytical data indicate that Se in pyrite is enriched, on average, 5.8 times over the Se content of the black shale matrix (which commonly contains microscopic grains of pyrite). This compares with Mo, which is only enriched 2.5 times relative to the matrix. In summary, the advantages of using Se in marine pyrite, rather than Mo, as a redox proxy are as follows: (1) Se is tightly held in the structure of pyrite and not released during deformation or metamorphism. In contrast, Mo is held more loosely and decreases in concentration with diagenesis and metamorphism (Large et al. 2014). (2) Se is evenly distributed in marine pyrite aggregates, compared to the patchy or zoned distribution of Mo and other redox-sensitive elements. Both Se and Co are redox sensitive, but in opposite directions, such that the ratio Se/Co in pyrite becomes an extremely sensitive atmosphere pO2 proxy (Large et al. 2017). This characteristic of Se and Co is demonstrated in Fig. 4, for a relatively detailed dataset of marine pyrite compiled for the Devonian to Carboniferous periods. Where Se concentration rises through the Early Devonian, Co concentration falls, and when Se falls in the Late Devonian, Co rises over this period. The opposite trends are also present through the Carboniferous. The reason for these opposing trends is due to the very different solution chemistry of Se and Co. 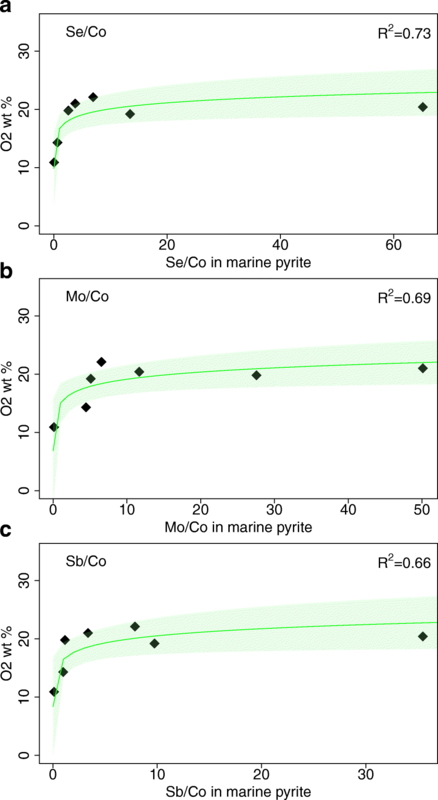 The oceanic distribution of Co is strongly affected by both micronutrient uptake and scavenging processes, making Co a hybrid-type trace element with very low residence time compared with Se and most other redox-positive trace elements (Saito et al. 2010). At moderate to high O2 conditions, Co adsorbs onto Fe3+ oxyhydroxides and Mn3+/4+ oxides and becomes immobilised (Murray and Dillard, 1979; Stockdale et al. 2010). However, under strongly reduced low O2 conditions, Co is released by reductive dissolution of both Mn and Fe oxyhydroxides and becomes mobile as Co+ or CoO (Dryssen and Kremling, 1990; Viollier et al. 1995). Thus, whereas Co becomes less soluble with increase in atmospheric oxygen, as it is immobilised by Fe and Mn oxyhydroxides that form during weathering; Se by contrast becomes increasingly soluble as selenate and selenite species. 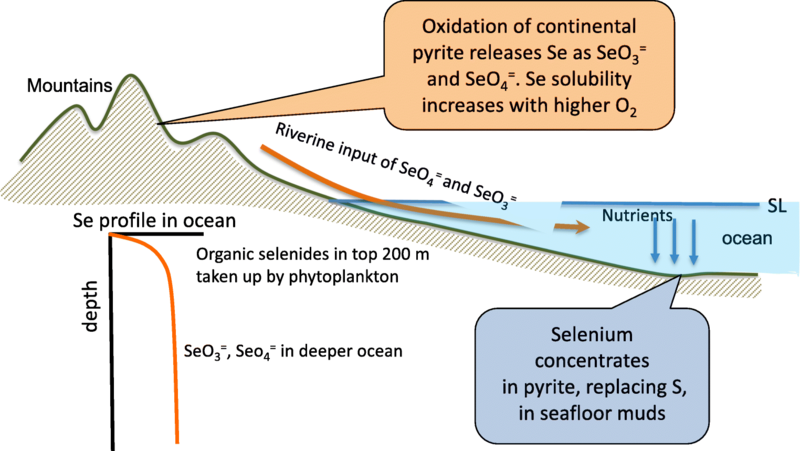 In a low-oxygen atmosphere, the reverse is the case, with Co becoming mobilised because of reductive dissolution of the oxyhydroxides, whereas Se becomes less mobile due to the insoluble nature of selenides, Se0 and organo-selenium complexes (Mukherjee and Large 2016). The time-series trends of four redox-sensitive trace elements Se, Mo, Co and Sb measured by LA-ICP-MS in marine pyrite from 133 Proterozoic and Phanerozoic black shale formations (Table S1) are shown in Fig. 5. These are depicted on a log scale with the median and standard deviation for each time interval (Table S2). Each trace element shows a different time-series pattern; the major difference being that the redox-positive trace elements (Se, Mo and Sb) show a general first-order flat or decreasing trend from 1800 to 1000 Ma, followed by an abrupt rise at 560 Ma. The redox-negative Co exhibits a gradual rising trend from 1800 to 1000 Ma, with an abrupt decrease at 560 Ma. The abrupt change at 560 Ma for all four elements suggests they are responding to the rise in atmosphere O2 at 560–520 Ma (NOE) recorded by other geochemical proxies (Scott et al. 2008; Sahoo et al. 2012). 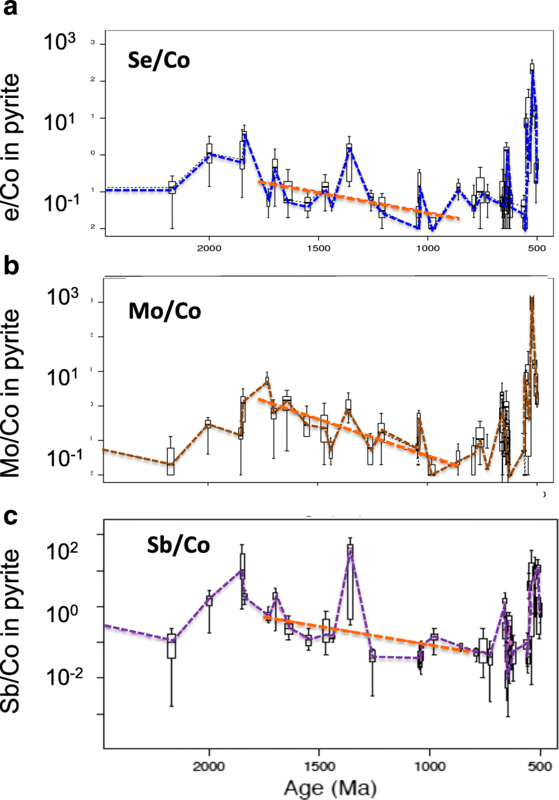 When the redox-positive proxies Se, Mo and Sb are each divided by the redox-negative proxy Co in marine pyrite, the resultant time series (Fig. 6) shows a consistent pattern of decrease from 1800 to 800 Ma and a sharp and consistent rise at NOE, followed by rapid and systematic fluctuations through the Phanerozoic. This pattern suggests a fall in O2 through the Mesoproterozoic and an abrupt rise at the end of the Neoproterozoic. In order to estimate the magnitude of these changes on atmosphere O2, we have used measurements of O2 concentration in marine halite (Blamey et al. 2016), combined with modelling of atmosphere O2 in the Phanerozoic (Berner 2005) in order to quantify the marine pyrite Se/Co proxy (Figs. 7 and 8). The composition of fluid inclusions in sedimentary halite is regarded as a robust paleoenvironmental indicator (Benison and Goldstein 1999) that has been measured back to the Neoproterozoic (Spear et al. 2014). Blamey et al. (2016) and Blamey and Brand (2019) have demonstrated, in several studies, that the gas trapped in halite fluid inclusions may in some cases reflect the ambient atmosphere. In a study of marine halite from the Empress 1A drill hole in the Browne Formation (830–800 Ma) from the Officer Basin in Western Australia, unaltered fluid inclusions were measured with oxygen gas contents ranging from 10.2 to 13.4 wt% O2, with a mean of 10.9 wt% (Blamey et al. 2016). Yeung (2017) argued that the halite inclusion measurements were affected by contamination with modern air and that a more likely estimate is ≤ 2 wt% O2. Blamey and Brand (2019) outline a screening protocol to detect leakage from halite fluid inclusions, and demonstrate that the original measurements of ~ 11 wt% O2 are likely to be correct. We have used both estimates in the calibration equations (Fig. 7; Eqs. 1 and 2) and time series (Figs. 8, 9 and 10). 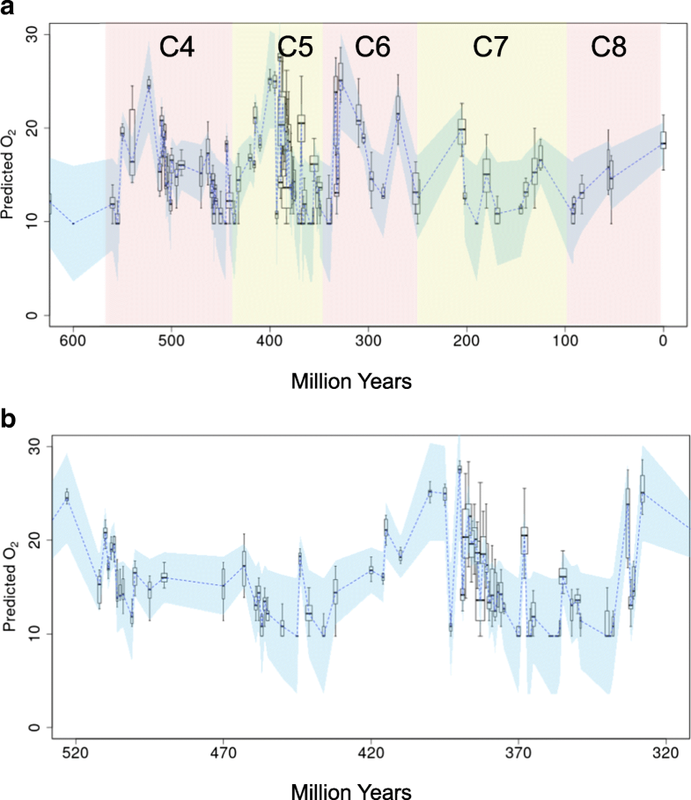 In a series of evolving models, based on computing the burial of carbon and sulfur in black shales through the Phanerozoic (GEOCARBSULF), Berner (1987, 2001, 2004, 2006) developed and refined the first time-series curves for atmosphere O2 (Fig. 11a). More recently, Bergman et al. (2004) and Lenton et al. 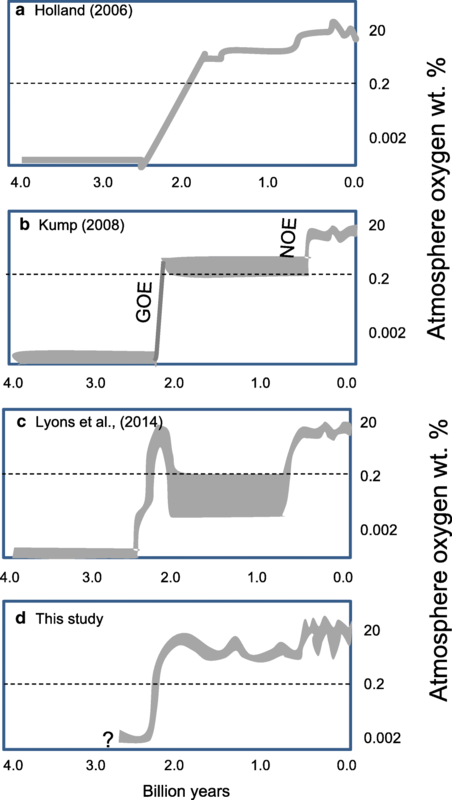 (2018) have developed the COPSE model for Phanerozoic atmosphere oxygen (Fig. 11b). The Berner models suggest O2 generally oscillated between 12 and 25 wt% for most of the Phanerozoic, but with a maximum up to 30 wt% O2 through the Early Permian (300–270 Ma). The Lenton et al. (2018) model gives a somewhat different pattern, with O2 rising from ~ 2 wt% at 470 Ma to a peak of ~ 30 wt% at 300 Ma, followed by variation between 20 and 30 wt% to the current time (Fig. 11b). Linear regression was used to describe the relationship of the logarithm of O2 with predictor Se/Co. The regression was fitted as a linear model using R version 3.4. To adjust for measurement errors in the reported historical data of Berner (2006), the analysis was weighted by the reciprocal variance, thereby allowing for error rates that may vary within the collated data. The modern value was assigned an average weight to avoid it dominating the regression. The fitted lines for the two oxygen estimates for 800 Ma halite (Blamey et al. 2016; Yeung 2017) are plotted in Fig. 7 along with 95% confidence intervals, and the resultant Proterozoic time series (Fig. 9) indicate that pO2 varied from a peak of 15–20 wt% in the Paleoproterozoic, to a minimum of < 2 to 10 wt% in the earliest Neoproterozoic, rising to over 25 wt% in the Early Cambrian (Fig. 8). Using the Blamey et al. (2016) oxygen estimate for halite at ~ 800 Ma gives a mean value for the Proterozoic of ~ 12 wt% O2, compared with the Yeung (2017) estimate giving a mean value of ~ 6 wt% O2 (Fig. 9). 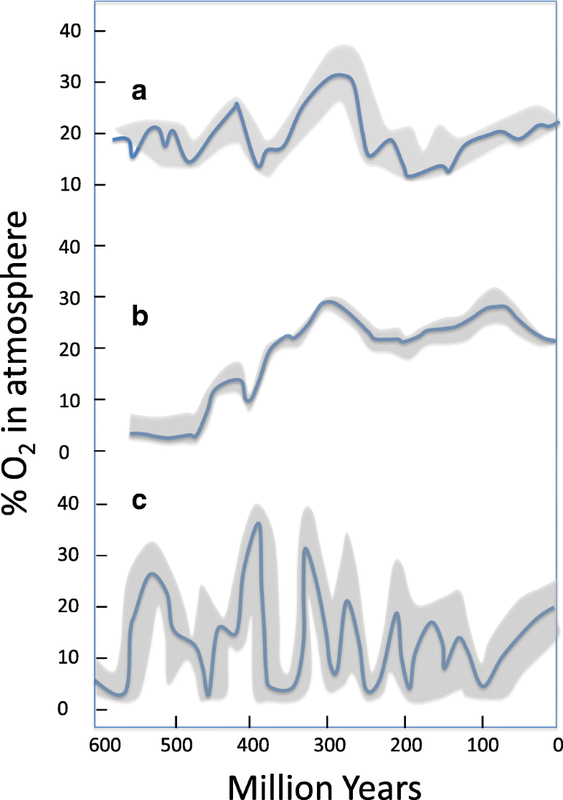 The four obvious features of our modelled atmosphere oxygen curve through the Proterozoic (Fig. 9) are as follows: (1) the elevated levels of oxygen, with a mean of ~ 6 to 12 wt% and maxima around 18 wt%; (2) the cyclic variation, defined by three broad cycles with wavelengths of 500–600 million years; (3) the overall decline in oxygen following the GOE from around 18 wt% at 2000–1800 Ma dropping to between 10 and 2 wt% at around 1000 Ma; and (4) the rapid rise in oxygen from a low at 560 Ma of ~ 2 wt% to a peak at 520 Ma of over 25 wt%. Two of these features are in agreement with previous studies: firstly, the rise in O2 following the GOE, and secondly, the step change (NOE) at the end of the Proterozoic to a peak of above 20 wt% in the Early Cambrian (Knoll and Holland 1995; Kump et al. 2011; Canfield 2005; Bekker and Holland 2012; Fig. 1). The peak in oxygen around 1400 Ma, which is defined by a series of pyrite measurements from the Velkerri Formation in northern Australia (Mukherjee and Large 2016), is also supported by geochemical studies of the ~ 1380-Ma Xiamaling Formation in the North China craton (Zhang et al. 2016, 2018; Wang et al. 2017). The cyclic nature of Proterozoic atmosphere oxygen is proposed here for the first time. The first cycle from 2200 to 1600 Ma follows the GOE and includes the Lomagundi carbon isotope excursion (2200–2060 Ma; Bekker and Holland 2012), related to burial of vast amounts of organic carbon and associated with a significant rise in atmosphere O2, evidenced by the first appearance of red beds and evaporites (Roscoe 1969; Melezhik et al. 2007; Schroder et al. 2008; Kump et al. 2011; Bekker and Holland 2012). The tail-end of this first cycle from 1800 to 1600 Ma is represented by a decrease in O2 from ~ 15 to ~ 5 wt% and corresponds to a drop in ocean micro-nutrients (Mo, Se, Co, Ni, Cd, Zn) over the same period (Mukherjee et al. 2018). The second oxygen cycle from 1600 to 1000 Ma has a peak around 1400 Ma of ~ 15 wt% and minimum of 2–10 wt% at ~ 1000 Ma. The timing of the oxygen peak at ~ 1400 Ma is supported by several black shale studies (Zhang et al. 2016, 2018; Mukherjee and Large 2016; Wang et al. 2017). The third cycle from ~ 1000 to 560 Ma is less well defined by the modelling, with possible peaks at 850 and 640 Ma and a minimum at ~ 560 Ma (~ 5–10 wt%), before oxygen rises steeply at NOE. 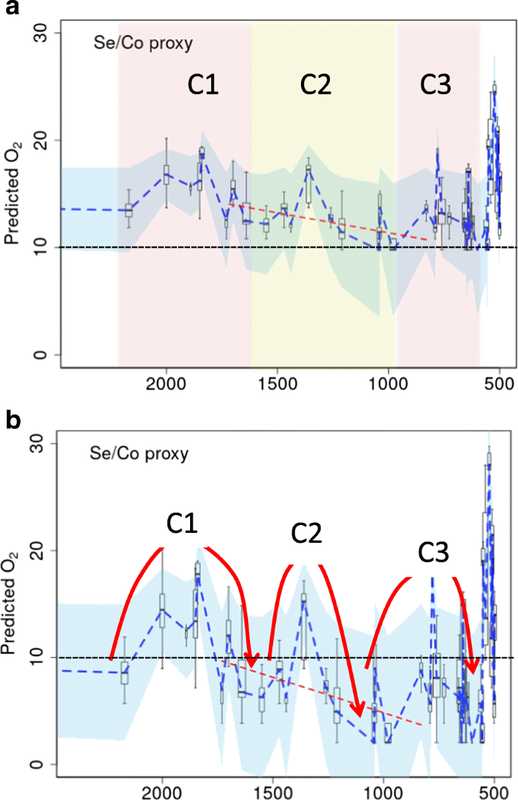 In stark contrast with the atmosphere oxygen cycles revealed from our modelling, Cr isotope data and modelling suggests pO2 levels were less than 0.2 wt% for most of the Precambrian, from 3000 to 1000 Ma (Planavsky et al. 2014, 2016; Cole et al. 2016). 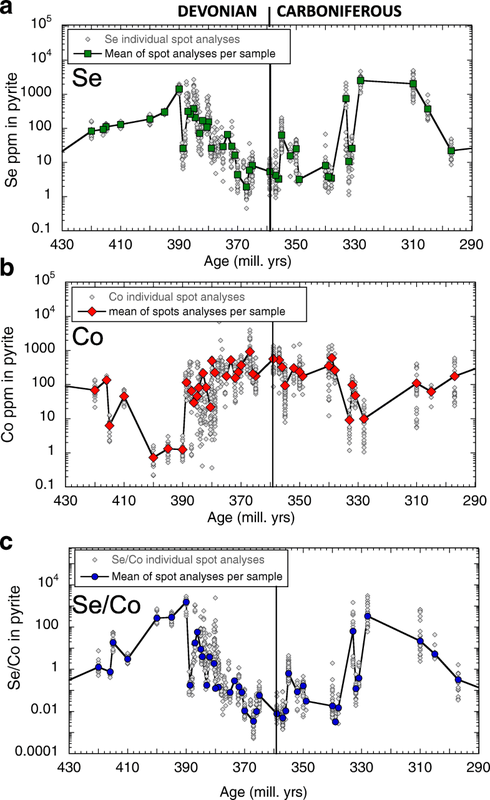 The fact that the GOE and oxygen rise related to carbon burial at the Lomagundi event are not recognised by the Cr isotope modelling (Cole et al. 2016: Fig. 3) leads to concern about the technique and its interpretation. There is abundant evidence for the GOE and Lomagundi as major events, not the least being the banded iron formation, red-bed, evaporate distributions and the sulfur isotope MIF signal and carbon isotope excursion. On this basis, we suggest rejection of the Cr isotope proxy as a useful method of determining O2 trends in the Proterozoic. This does not prove that the combined marine pyrite–halite–Berner proxy is correct for the Proterozoic; however, we suggest it does remain the best viable option, as it is compatible with many previous studies (Holland 2006; Knoll and Holland 1995; Kump 2008; Bekker and Holland 2012; Zhang et al. 2016). The evidence supporting the two oxygen models for the middle Proterozoic is summarised in Table 2. The lack of marine banded iron formations between 1800 and 800 Ma suggests that soluble Fe2+ was not present in significant amounts in the ocean. This is best explained by an oxidised ocean atmosphere system where only small amounts of insoluble Fe3+ were present in the oceans. Manganese is only soluble in the ocean as Mn2+. It requires even more reducing conditions than Fe for buildup in the ocean. The lack of sedimentary Mn deposits between 1800 and 800 supports an oxidised ocean system where Mn could not build up. Marine evaporite indicates plenty of sulfate in the ocean, which can only occur under an oxidised atmosphere. The sporadic occurrence of marine evaporites through the Proterozoic at the following times—2000 Ma (Karelia, NW Russia), 1800–1400 Ma (McArthur Basin), 900 Ma (Amadeus Basin) and 815 Ma (Officer Basin)—is supportive of an oxygenated atmosphere in the Proterozoic. Sedimentary deposits from hydrothermal emanations associated with mineral deposits on the deep Proterozoic seafloor are commonly enriched in hematite or magnetite, suggesting oxidised bottom water conditions. Major deposits of sedimentary U, sedimentary Cu and sedimentary Zn are present in both the Proterozoic and Phanerozoic, but absent from the Archean. Hydrothermal transport of these metals required an oxidised upper crustal fluid, which would only be possible under an oxidised atmosphere. Major sediment-hosted deposits of gold and volcanic-hosted massive sulfide deposits are present in the Archean but not between 1700 and 1200 Ma in the Proterozoic. These deposits require for their formation a reduced upper crustal fluid, suggesting that such reduced fluids were absent from the Mesoarchean. Fluid inclusions in sedimentary halite from the Browne Formation, Officer Basin, Western Australia, have been shown to contain high levels of O2, indicative of about 11 wt% oxygen in the atmosphere at 815 Ma. A robust protocol has been developed to ensure that the fluid inclusions have not leaked or exchanged with the current atmosphere. Redox-sensitive trace elements are delivered to the ocean from oxidative weathering of continental sulfides. Se like S and Mo is redox positive and accumulates in pyrite in organic-rich muds. The ratios Se/Co and Mo/Co have proved to be robust indicators of atmosphere oxygenation. Recent modelling of these ratios suggests O2 declined from ~ 18 wt% to less than 2 wt% O2 over the time span 1800 to 1000 Ma. Siderite deposits in ferruginous marine settings associated with banded iron formations and pyritic black shales. The lack of sedimentary siderite in carbonate-rich sequences from 1800 to 800 Ma suggests that the oceans were not ferruginous. The lack of BIFs from 1800 to 800 could be explained if the Proterozoic oceans were very reduced and sulfidic (H2S bearing), whereby soluble Fe would be continually deposited as sedimentary pyrite, rather than accumulate to form BIFs. The degree of fractionation of sulfur isotopes δ34S in sedimentary pyrite is considered to relate to sulfate availability in the ocean, which is in turn connected to O2 concentration in the atmosphere. Low isotope fractionation through the mid-Proterozoic has been interpreted to mean low sulfate content of the oceans. Large enrichments in redox-sensitive elements (e.g. Mo, U, V, Cu, Se) are considered to develop only in oxic oceans. Reduced oceans are therefore expected to develop black shales with lower levels of these elements. Studies of Mo, U and Zn in Proterozoic black shales demonstrate levels of RSE, greater than the Archean, but less than the Phanerozoic. In black shales, the amount of Fe held in highly reactive phases (FeHR), compared to iron in sulfides (Fesul) and total iron (FeT), is dependent on redox bottom water conditions. Studies applying this approach suggest that oxygen-deficient anoxic ferruginous conditions may have been persistent throughout both the Archean and Proterozoic. The geochemical behaviour of Cr is sensitive to the redox state of the atmosphere as oxidative weathering produces the hexavalent form Cr6+. Cr isotope measurements in BIFs, iron stones and black shales from 2200 to 1000 Ma suggest O2 content of < 0.2 wt% in the atmosphere. Compared to the Proterozoic, the oxygen cycles in the Phanerozoic have a greater amplitude but shorter frequency (Figs. 10 and 11). Our modelling suggests at least five cycles (numbered 4 to 8; Fig. 10a) with wavelengths of 60 to 120 million years and peak oxygen values of 20 to 35 wt% O2 in the Middle Cambrian, Middle Devonian, Middle Carboniferous (and Middle Permian), Late Triassic and the Quaternary. These oxygen levels are extreme compared with previous estimates. For example, Lenton and Watson (2000) suggest that O2 concentrations above 25 wt% are incompatible with the existence of forests due to likelihood of widespread wild fires at O2 levels above 25 wt%. However, Berner et al. (2003) points to the work of Komrek (1973) which suggests that plants may adapt defences to fire under a regime of increasing O2 over time, such as was likely in the Early to Middle Carboniferous from 340 to 320 Ma (Fig. 11) when forest cover was very extensive. The global rain forest collapse event around 305 Ma follows a period of extreme O2 levels (25–35 wt%; 325–310 Ma, Fig. 11), suggesting forest fires may have been a dominant factor (Uhl et al. 2004). Other modelling would suggest that more likely maxima do not exceed 32 wt%, and minima may not go below 10 wt% (Berner 2007, 2009: GEOCARBSULF; Lenton et al. 2018: COPSE). Compared with these other models, the sedimentary pyrite model developed here shows more variability and a series of regular cycles with frequent periods when oxygen exceeds 25 wt% and drops below 10 wt% (Fig. 12). Our new modelling for atmospheric oxygen levels has some major implications for the evolution of early eukaryotes that are contrary to previous notions. Past studies have highlighted the importance of oxygen in driving evolution and that low concentrations thwarted biological evolution, particularly impeded metazoan evolution (Scott et al. 2008; Planavsky et al. 2014; Sahoo et al. 2012; Lyons et al. 2014). Our model suggests that oxygen concentrations may have been grossly underestimated in the recent past and that there was sufficient oxygen (1 to 15 wt%) in the Proterozoic to facilitate eukaryotic evolution including that of metazoans. This raises two questions: (a) was oxygen the sole driver of evolution of complex life? and b) what then precluded the appearance of metazoans prior to ~ 750 Ma if there were sufficient oxygen levels? Key findings from Danovaro et al. (2010) and Mills et al. (2014) highlight that oxygen is required in small amounts (as low as 0.5–4 wt%) by primitive animals, less than the estimates for the Proterozoic from this study. Therefore, oxygen may not have been the important driver of evolution through the Proterozoic, and other factors, such as macro and micro bio-essential nutrient-element availability, should be included as essential parts of geochemical models alongside oxygen (Large et al. 2014; Mukherjee et al. 2018). Conventionally, evolution of O2 in the atmosphere is thought to control processes in the biosphere. It is quite possible that the reverse is the case, and changes in the biosphere may have contributed to changes in O2 concentrations of the ocean–atmosphere system (Butterfield 1997; Lenton et al. 2014; Mukherjee et al. 2018). Although we have limited data, the period of the Ediacaran biota from 575 to 560 Ma appears to correspond with very low atmosphere oxygen < 2 to 6 wt% and very low micro-nutrients. Our modelling suggests the Cambrian explosion is associated with both a steep rise in micro-nutrients (Mukherjee et al. 2018) and a coincident rise (cycle 4) in atmosphere O2 from ~ 2 to 25 wt%, peaking at 525 Ma. However, the rise is short lived, dropping to a minimum possibly as low as ~ 3 wt% O2 at 500 Ma, and then a deeper minimum at 450 Ma of < 2 wt% O2 (Fig. 11). Both minima correspond to mass extinction events; the first at 500 Ma is coincident with widespread ocean anoxia during a middle Cambrian mass extinction event (Gill, 2011), and the second very deep minimum at 450 Ma is coincident with the first of the big five mass extinctions, in the late Ordovician. 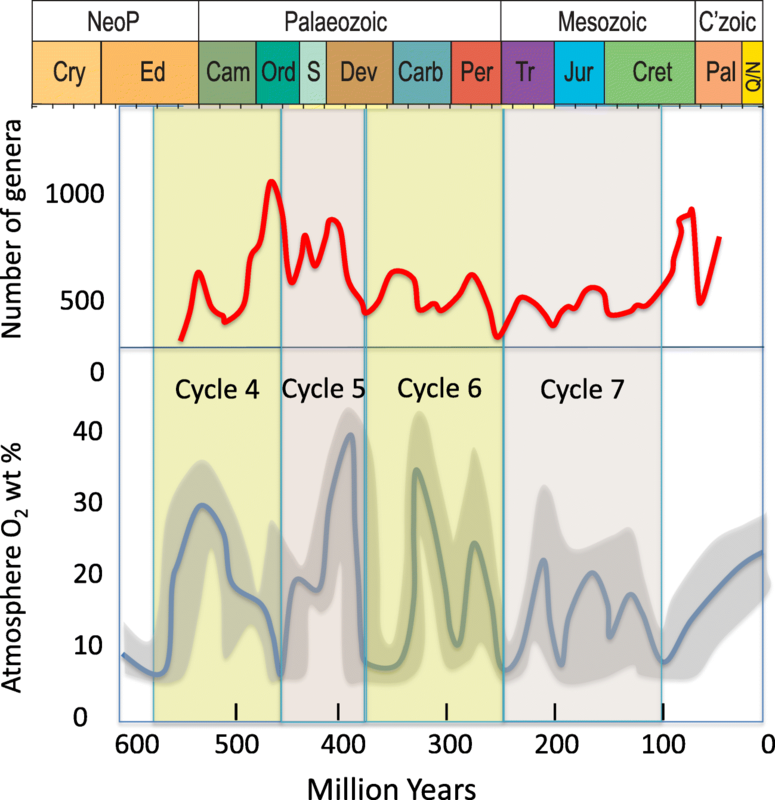 This mass extinction marks the end of cycle 4; in fact, each of oxygen cycles 4, 5, 6 and 7 (Fig. 10) ends with mass extinctions at ~ 450, ~ 370, ~ 250 and ~ 200 Ma (Sepkoski (1997), coinciding with periods of very low atmosphere oxygen, estimated at < 2 to 10 wt O2. Large et al. (2015b) and Long et al. (2015) previously emphasised the decrease in micro-nutrients, especially the nutrient trace element Se, as a potential cause for these mass extinctions. The coincident decrease in both oxygen and micro-nutrients at these times would have made life extremely difficult. The long period of low oxygen from 380 to 340 "Ma) (Fig. 10) coincides with time of very few vertebrate fossils and is considered to represent a low point in vertebrate diversity, named Romer’s gap (Ward et al. 2006; Sallan and Coates 2010). Ward et al. (2006) and Berner et al. (2007) recognised the relationship of low atmosphere oxygen to Romer’s gap; however, they suggested a minimum of 12 wt% O2, compared with our modelling of 8 to 10 wt% O2. Whereas our modelled estimates of low atmosphere O2 at the end of each cycle correspond to mass extinctions, the periods leading to the peaks of each cycle appear to correlate with major evolutionary events. Rohde and Muller (2005) noted a 62-million-year cycle of marine animal diversity through the Phanerozoic. A comparison of our oxygen cycles and the Rohde and Muller (2005) 62-million-year cycles (Fig. 13) shows some similarities, with our cycles generally corresponding with two of the 62-million-year marine animal diversity cycles. Most of the peaks in the animal diversification cycles correspond with peaks in our atmosphere oxygen cycles, although some are displaced a few million years (Fig. 13). Cycle 4, for example, started with the Cambrian explosion at ~ 550 Ma, where O2 rose from < 5 to 25 wt%; most modern metazoan phyla appeared for the first time and the rate of diversification of organisms accelerated dramatically (Butterfield 2007). At the peak of cycle 4, the first fish appeared (~ 525 Ma), followed by the first land plants (~ 500 Ma). Approaching the peak of cycle 5, giant fish evolved (~ 410 Ma), followed by the first forests at the peak of cycle 5 (~ 395 Ma). The earliest reptiles appeared at the peak of cycle 6 (~ 325 Ma), and dinosaurs evolved at the first peak in cycle 7 (~ 200 Ma). Flowering plants appeared on the second peak of cycle 7 (~ 130 Ma). Our model suggests the Great Ordovician Biodiversification Event from 485 to 445 Ma (GOBE; Harper 2006) occurred towards the latter part of cycle 4 and was not associated with a major rise in atmosphere O2 (Fig. 13). Copper is transported in low-temperature basinal brines as a cuprous chloride complex (CuClo) with solubility increased due to increasing fluid oxidation, salinity and acidity (Haynes and Bloom 1987). Haynes and Bloom (1987) demonstrated that at least 800 ppm copper can be transported in low-temperature slightly alkaline brines with elevated oxygen fugacity > 10−60 bars, well above the hematite–pyrite boundary. By comparison, they found that only about 80 ppm zinc can be transported under the same conditions. The relationship of sedimentary copper deposits to increases in atmosphere oxygen was first pointed out by Knoll and Holland (1995) when they noted their first appearance following the GOE, along with red beds and the first evaporites. 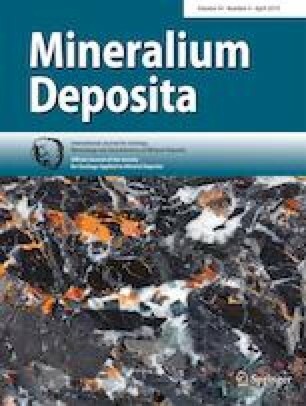 The Udokan deposit in Siberia (~ 24 million tonnes of Cu) is the oldest major deposit, recently reported as 1896 ± 6 Ma (U–Pb on titanite) by Perelló et al. (2017). On our new oxygen–time curve (Fig. 14a), the position of Udokan is clearly at the top of the first oxygen cycle in the Proterozoic, when all the favourable ingredients were available for the first time: oxygenated upper crustal fluids, red beds, evaporites and black shale trap rocks. The second oxygen cycle in the Proterozoic from 1600 to 1000 Ma has one major sediment-hosted copper deposit, White Pine, Michigan, USA (> 10 million tonnes of Cu), but it does not correspond with the peak of the cycle. White Pine is hosted in the 1100 Ma Nonesuch Shale and, as such, occurs on the flank of cycle 2, closer to the trough than the peak (Fig. 14a). The copper mineralisation is considered to be diagenetic and thus around 1100 Ma (Kirkham 1986 and references therein; Ho and Mauk 1996). There are no known sediment-hosted copper deposits that correspond in age with the peak of oxygen cycle 2 at ~ 1400 Ma. The massive deposits of the Central African Copper Belt (CACB) in Zambia and the Congo (> 220 million tonnes of Cu) are of Neoproterozoic age, associated with red-bed clastics in the footwall, black shale in the main ore position and evaporites in the hanging wall. There has been much discussion about the precise age of the deposits, with the available data suggesting a protracted history of evolution from 850 to 490 Ma (Selley et al. 2005; Hitzman and Broughton 2017). Dating of the ores has revealed three main periods of copper mineralisation: (1) The stratiform least deformed ores at Konkola and bornite in sedimentary nodules in the host rocks have been dated by the Re–Os method at 816 + 62 Ma (Barra et al. 2004) and ~ 800 Ma (Muchez et al. 2015), recording the earliest and principal episode of copper mineralisation during host rock diagenesis; (2) the Musoshi ores in Zambia and U–Cu mineralisation in the Democratic Republic of Congo (DRC) has been dated by U–Pb methods in the range 645–652 Ma (Richards et al. 1988; Decrée et al. 2011) around the time of the global Marinoan glaciation; and (3) a number of deposits in both Zambia and the DRC, including Lufubu South, Chibuluma South, Mufulira, Mujimbeji and several others, have been dated by Re/Os on molybdenite in the range 540 to 490 Ma (Sillitoe et al. 2017) corresponding to the late stages of the Lufilian orogeny (Saintilan et al. 2018). Whether these are three discrete mineralisation events or a continuum is not clear; however, the three events, if real, do correspond with peaks in elevated atmosphere O2 defined by our new oxygen curve (Fig. 14a). The first two mineralisation periods correspond to oxygen peaks in the third Proterozoic cycle at ~ 820 and 650 Ma. The third mineralisation period (or remobilisation of previous mineralisation) in the CACB, 540–490 Ma, defines the NOE peak, and the fourth cycle of oxygenation is associated with the end of the Lufilian orogeny. As this third event is an epigenetic event at considerable depth in the crust, the connection to atmosphere oxygenation is less likely. However, as discussed later, the Lufilian orogenic event is indirectly related to the rise in atmosphere oxygen. The Permian Kuperschiefer hosts a number of major sediment-hosted copper deposits in Europe (> 200 million tonnes of Cu). Red-bed clastic rocks, evaporites and organic-rich shales are key ingredients of all the deposits. The mineralisation is considered to be diagenetic following sedimentation (Wedephol and Rentzsch, 2006). With respect to the Phanerozoic oxygen cycles (Fig. 14b), the footwall red beds of the Rotliegendes fluvial clastic rocks were deposited from ~ 300 to 260 Ma across the second peak of oxygen cycle 3 (this cycle has two peaks at ~ 325 and ~ 260 Ma). Then followed the Zechstein sequence of evaporites and basal carbonaceous shale, which were deposited during a short interval of ~ 258 to 251 Ma (Taylor 1998), closely followed by the copper mineralising event. The first peak in the Phanerozoic cycle 6 at 330–310 Ma corresponds with the timing of the Upper Carboniferous Dzhezkazgan sediment-hosted copper deposit (approximately 2 billion tonnes at 1.1% Cu) in Kazakhstan (Box et al. 2012). No major sediment-hosted copper deposits are known to be associated with the cycle 5 peak in the Middle Devonian ~ 390 Ma. All sediment-hosted massive sulfides of Zn–Pb–Ag (SHMS or SEDEX) are hosted by organic-rich black shales or their metamorphic equivalents. The characteristics of the black shales suggest, in nearly all cases, anoxic to euxinic bottom water conditions (Large 1983; Goodfellow 1987, 2004; Large et al. 2005). The ores are interpreted as either syngenetic on-seafloor deposition or diagenetic sub-seafloor replacement (Goodfellow 1987; Broadbent et al. 1998; Large et al. 1998; Leach et al. 2005; Sangster 2018). In either case, most authors consider that reduction of seawater sulfate to metallic sulfides in an organic-rich anoxic environment, during hydrothermal fluid input, is the principal process of zinc and lead sulfide deposition. It is therefore not surprising that SHMS zinc deposits in both the Proterozoic and the Phanerozoic form during periods where our modelling suggests low atmosphere and ocean oxygen towards the end of the O2 cycles (Fig. 14). In the Proterozoic, the major SHMS deposits, including Mt. Isa, McArthur River, Century, Rampura Agucha, Dariba-Rajpura, Gamsberg and Sullivan formed over the period 1800 to 1450 Ma towards the end of cycle 1 when atmosphere O2 was on the decline from ~ 10 to ~ 5 wt% (Fig. 14a), and the upper-most open ocean was significantly saturated in sulfate to provide a source of S for the deposits. This is interpreted to be a period of widespread anoxic, possibly ferruginous, stratified oceans, capable of depositing metallic sulfides and abundant pyrite due to the influx of hydrothermal Fe–Zn–Pb brines into third-order sub-basins. In the Phanerozoic, SHMS zinc deposits coincide with periods of very low atmosphere O2 (~< 5 wt%) at the end of oxygen cycles 4 and 5 (Fig. 14b, c). Towards the end of cycle 4, at 510 Ma are the deposits of the Anvil district in the Selwyn Basin, Faro, Grum, Dy and Vangordia (Goodfellow 2004), followed at ~ 450–435 Ma by the end-Ordovician deep anoxic event including El Aguilar, Argentina, and Howards Pass, Selwyn Basin (Gemmell et al. 1992; Goodfellow and Jonasson 1986). At the end of cycle 5, in the Late Devonian to Early Carboniferous (380–340 Ma), during a long-lived period of low O2 <~ 5 wt%, including the Late Devonian mass extinction events, are Rammelsberg and Meggen, Germany (~ 370 Ma); Elura, Australia (~ 370 Ma); Cirque in the Gataga district, British Columbia, Canada (~ 370 Ma); Jason and Tom, Yukon, Canada (370–350 Ma); and Navan, Lisheen, Silvermines and Tynagh in Ireland (340 Ma) (Goodfellow 2004 and references therein). 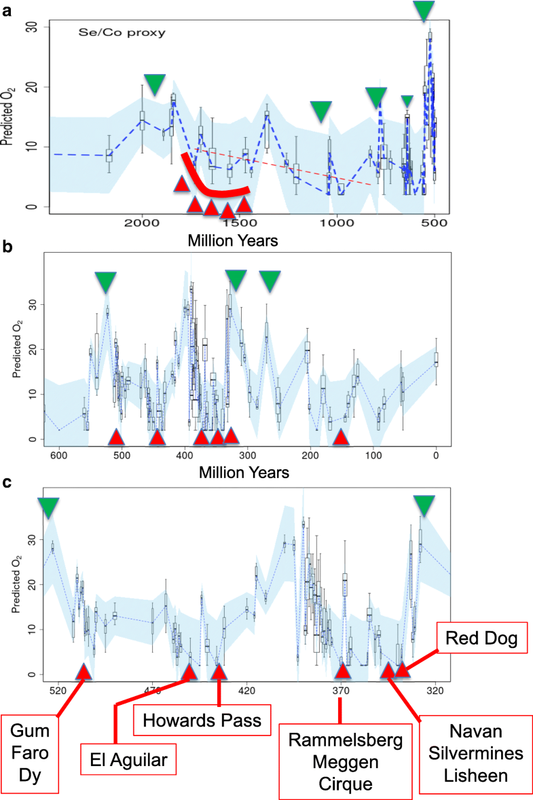 Finally, the largest of the SHMS deposits, Red Dog and associated deposits in the Brooks Range, Alaska, are time equivalent with the end of this long period of ocean anoxia and low atmosphere O2 dated by fossil evidence from 345 to 323 Ma (Dumoulin et al. 2004; Young 2004). The consistent correlation between our modelled times of low O2 and the formation of SHMS Zn (Fig. 14) demonstrated here is dramatic and highlights the importance of stratified anoxic basins in the genesis of major zinc deposits, as originally proposed by Goodfellow (1987). The biologically mediated reduction of seawater SO42− to H2S on or beneath an anoxic sea floor environment, to facilitate the precipitation of sphalerite and galena, is the key process involved in SHMS genesis. In addition to SHMS zinc deposits, many volcanic-hosted massive sulfide (VHMS) zinc districts also coincide with periods of low atmosphere oxygen, for example, the Cambrian deposits of the Mt. Read Volcanics (~ 500 Ma); Woodlawn and Captains flat, NSW, Australia (~ 424 Ma); Devonian deposits in the Urals district, Russia (~ 375 Ma); Myra Falls district, British Columbia, Canada (~ 366 Ma); and the giant deposits of the Iberian Pyrite Belt (~ 360 Ma). However, for VHMS, there is not a one-to-one relationship, as some Cu-rich VHMS deposits occur at times of elevated atmosphere and ocean oxidation (e.g. Degrussa, Western Australia at 2000 Ma; Windy Craggy, Canada, at 218 Ma). What drives the O2 cycles? The major causative factors for atmosphere O2 increases are considered to be, in order of process, as follows: (a) tectonic plate collisions and mountain building which leads to increased weathering and supply of nutrients to the oceans; (b) increase in the ratio of mafic to felsic components in the Upper Continental Crust, which also leads to an increased flux of nutrient major and trace elements to the oceans; (c) the increased ocean nutrients generate increased productivity and photosynthesis; (d) leading to increased burial of carbon and sulfur in pyritic black mudstones on the ocean floor. These events occur in a cyclic manner controlled by supercontinent cycles. The peak in O2 cycle 1 at around 18 wt% O2 from 2100 to 1800 Ma covers the end of the Lomagundi event and possibly relates to a combination of mountain building during amalgamation of Nuna (Cawood et al. 2013), elevated nutrient flux (Mukherjee et al. 2018) and widespread burial of carbon and sulfur (Melezhik et al. 2007). The long decline in O2 from 1800 to ~ 1000 Ma may be explained by a change to dominantly felsic uppermost continental crust causing a continuous low nutrient flux and drop in productivity (Large et al. 2018). 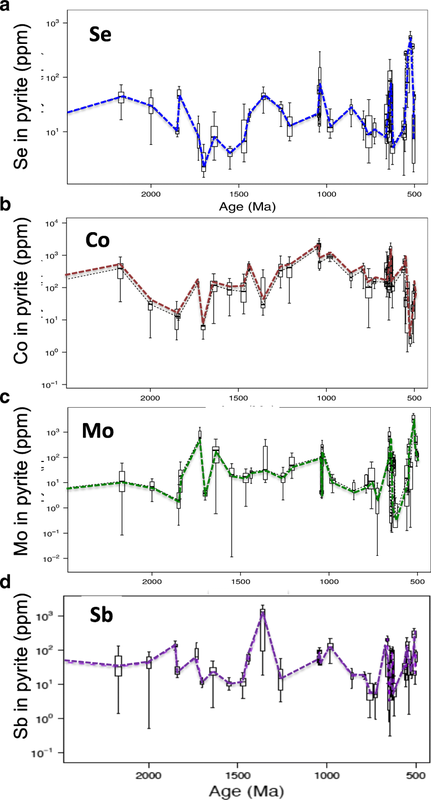 The peak in O2 at 1350 Ma coincides with a period of intense burial of carbon and sulfur probably related to collision of plates to form Rodinia and related Grenville-aged tectonic events (Zhang et al. 2016; Mukherjee and Large 2016). From 1000 to 600 Ma, the O2 estimate is variable around ~ 5 wt% with spikes related to the snowball Earth events. At NOE (560–520 Ma), the sharp rise in ocean nutrients and atmosphere O2 to 25 wt% has been ascribed to plate collisions and mountain building, particularly the trans-Antarctic–East African mountains (Squire et al. 2006; Campbell and Allen 2008). Throughout the Phanerozoic, there is an approximate correlation between the oxygen cycles and plate collisions and mountain building orogenic events. For example, the peak of O2 cycle 5 coincides with the Acadian orogeny, the main peak in cycle 6 with the Hercynian orogeny, the second peak in cycle 6 with the Central Asian orogeny and the peak in oxygen in cycle 7 with the Alpine orogeny. Between the O2 cycle peaks, the continents are drifting and gradually rifting apart, leading to the development of more stable stratified oceans with anoxic bottom waters developed in second- and third-order basins. Rifting may be associated with seafloor hydrothermal activity, providing the metal source for SHMS and VHMS deposits. There are a number of suggested limitations of the methods applied here to estimate atmosphere oxygen trends and levels over the last 2200 million years. Only the earliest formed syngenetic or early diagenetic pyrite should be analysed to gain trace-element trends in the oceans. Later forms of pyrite have lower trace-element concentrations, due to loss of trace elements during pyrite recrystallisation (Large et al. 2014). We have undertaken petrographic screening to reduce this effect. The method may measure pore water trace-element concentrations rather than seawater concentrations. Framboidal and early diagenetic pyrite develops in the water column or the top few millimetres of seafloor muds. In these cases, the pore fluid is at least 80% seawater (Baldwin and Butler 1985; Wilkin et al. 1996). 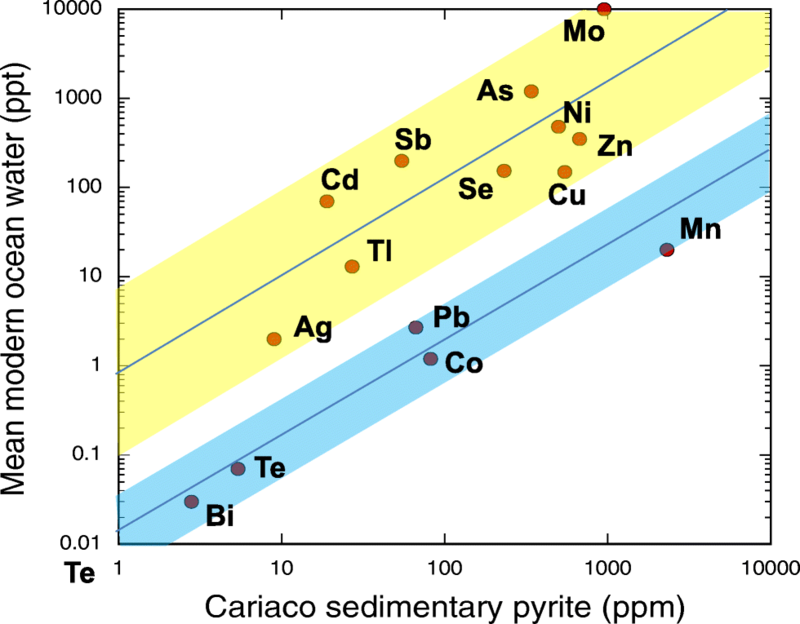 Scatter of individual pyrite analyses is high, leading to a broad envelope of uncertainty (e.g. Fig. 4). However, first-order trends and cycles are still recognisable and are repeatable for different trace elements (e.g. Fig. 5). The ocean trace-element trends are assumed to be ocean-wide but may be controlled by local inputs at the sample site. Analysis of samples over several hundred metres of stratigraphic thickness (representing tens of millions of years) demonstrates consistency of element trends and suggests local effects are unlikely to be significant (e.g. Fig. 4). The use of Berner’s model oxygen curve to assist in standardising the pyrite Se/Co curve is not ideal. However, only broad trends in the Berner model are used, to assist in obtaining mean O2 levels for the Phanerozoic. The O2 concentrations in halite in the Proterozoic measured by Blamey et al. (2016) have been disputed by Yeung (2017) who made his own estimates. Both estimates are used in our modelling and indicate minimum O2 level changes, but the overall trends in O2 are the same. Blamey and Brand (2019) have developed a protocol to screen out samples where the fluid inclusions in halite have leaked, and have verified their initial estimates. The best evidence that the trace-element chemistry of marine pyrite is a robust first-order proxy for trace-element concentration trends in the oceans is the consistency of the trends in the data over tens, hundreds and thousands of millions of years. Figure 4 shows this clearly for concentrations in sedimentary pyrite of both the redox-positive element Se and the redox-negative element Co, which trend in opposite directions, as predicted by their redox chemical behaviour. Laser ablation ICP-MS analysis of over 3000 sedimentary pyrite aggregates in black shales through time has enabled the development of time-series trends for redox-sensitive trace elements for the Proterozoic and Phanerozoic oceans. By combing data for the redox-positive Se with the redox-negative Co, a proxy for variation of atmosphere oxygen through time has been established. 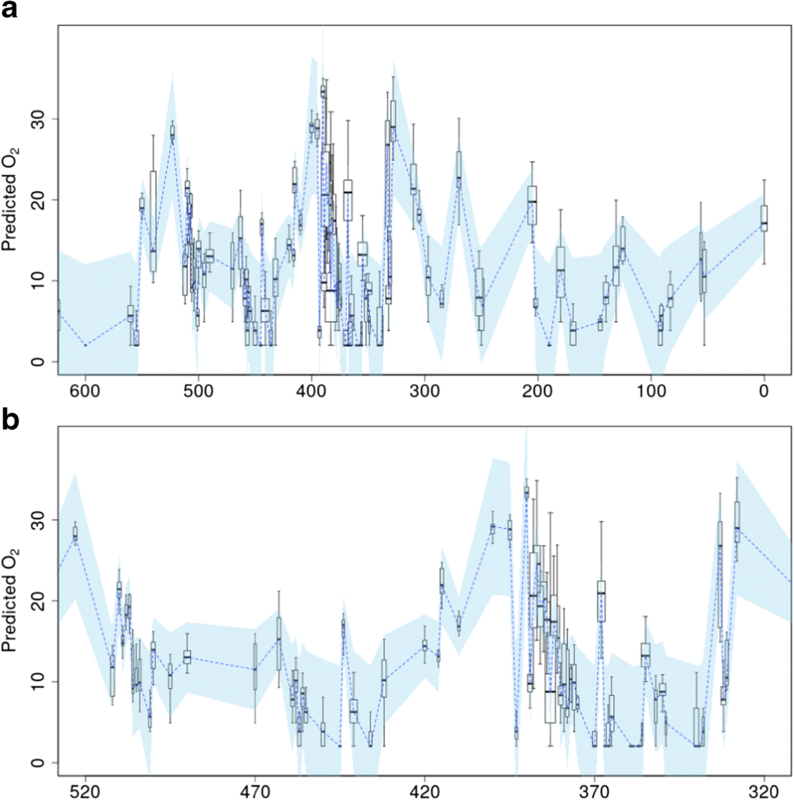 This proxy is quantified, in the first-order sense, by comparison with modelling of Phanerozoic atmosphere oxygen by Berner (2006) and measurement of oxygen in Proterozoic sedimentary halite by Blamey et al. (2016). The resultant proxy suggests that atmosphere oxygen likely varied in a cyclic manner from a maximum of ~ 18 wt% in the Paleoproterozoic following the GOE to less than 2 wt% in the Neoproterozoic, rising abruptly at ~ 560 Ma to over 25 wt%. The oxygen cycles speed up through time, with three broad cycles of 400 to 600 million years length in the Proterozoic, changing to five cycles of 60 to 150 million years length in the Phanerozoic. The postulated oxygen cycles in the Phanerozoic attain maxima of 25 to 30 wt% and minima of 2 to 10 wt%. The oxygen cycles in the Phanerozoic match previously identified biodiversification cycles, and each oxygen cycle ends in a major mass extinction event, when oxygen in the atmosphere and nutrient trace elements in the oceans dropped to minimum concentrations. The cycles are likely driven by super continent collision, consequent mountain building, erosion and a rise in nutrient flux to the oceans. Major stratiform sedimentary copper deposits appear to occur at times when oxygen in the ocean–atmosphere system was at a peak in both the Proterozoic and Phanerozoic, whereas major stratiform sediment-hosted zinc deposits occur at times when oxygen was at a minimum. Many thanks to colleagues who assisted in the sampling of black shale formations and to those involved in the LA-ICP-MS analysis of the sample set used in this study; in particular, Jacqueline Halpin, Valeriy Maslennikov, Patrick Sack, Stuart Bull, Peter McGoldrick, Timothy Lyons, Clive Calver, Robert Scott, Ray Coveney Jr., Jeffrey Abbott, Bradley Guy, David Huston, Grant Garven, Lex Lambeck, Marcus Kunzman, Charles Makoundi, Sean Johnson, Richard Batchelor, Stuart Smith, Mikhail Krupenin, Jerry Sharrock, Peter Sorjonen-Ward, Luba Leonova, Valeriy Murzin, Sergey Karpov Sebastien Meffre, Elena Lounejeva and Irina Zhukova. The Geological Surveys of Tasmania, South Australia, Queensland, Western Australia and Northern Territory are thanked for providing access to drill core samples. Thanks also to F. Tornos and B. Lehmann for their review comments. ARC Discovery (DP150102578) provided the funding for this research.